The strawberry (Fragaria) is a genus of plants in the rose family. There are more than 20 named species and many hybrids and cultivars. The most common strawberries grown commercially are cultivars of the Garden Strawberry, a Fragaria × ananassa hybrid. The Woodland Strawberry was widely cultivated in Europe before being largely replaced by the Garden Strawberry (Fragaria x ananassa and other hybrids), which have much larger berries. Woodland Strawberry fruit is strongly flavoured, and is still grown on a small scale comercially for the use of gourmets. Most species send out long slender runners that produce new plantlets. 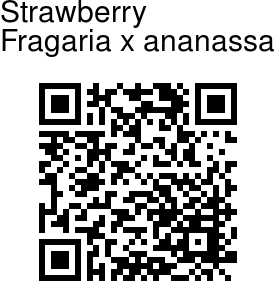 Fragaria belongs to the family Rosaceae in which there are a whole lot of individual female reproductive organs, termed carpels, in the flower. 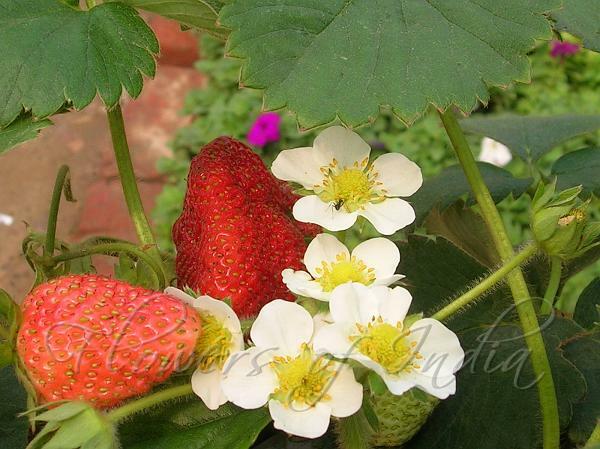 The strawberry flower is about an inch in diameter with five white petals and a yellow center. After the strawberry flower is pollinated, it becomes the aggregate fruit. Strawberries are eaten by birds which disperse the seeds widely.